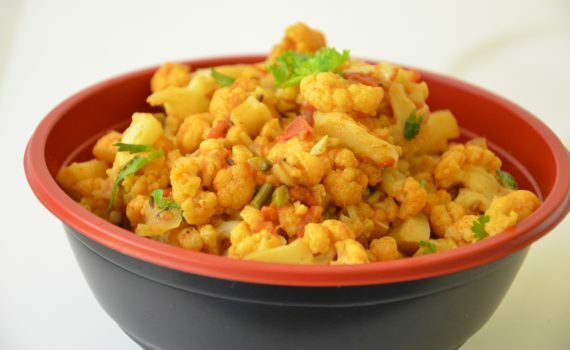 Cauliflowers are a good source of vitamins like vitamin C and K , thiamin, riboflavin, niacin, magnesium, phosphorus, vitamin B6, folate, and beta-carotenes, minerals, proteins, antioxidants, phytochemicals and fibre. 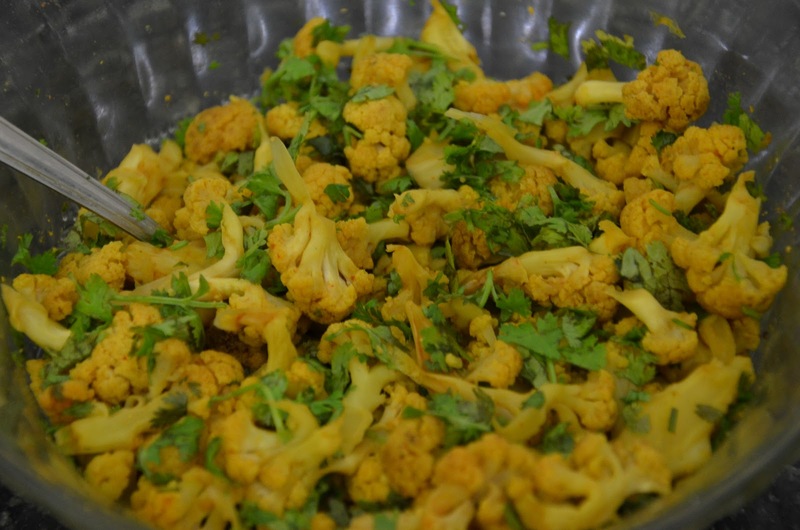 The sulphur content of cauliflower has been found to benefit heart health and fight cancers. Heat oil in a kadai, add the jeera and turmeric powder, then the tomatoes and salt and saute till the oil leaves the sides. Add the cauliflower florets and mix well. Cover and cook on very low flame (you can also use a deep steel plate with sides as the lid and add some water on the top, the cauliflower will cook in it’s own water). Keep checking and mix well, sprinkle a little water if needed. Switch off till the cauliflower is cooked. Garnish with cilantro and serve as a side with rice and dal or with roti’s. The Microwave version of the Gobi/Cauliflower sabzi was inspired by my mother-in-law who uses the microwave daily for her cooking (and not just for reheating stuff). I’ve tried making it with absolutely no oil, but you could add a teaspoon if you want. 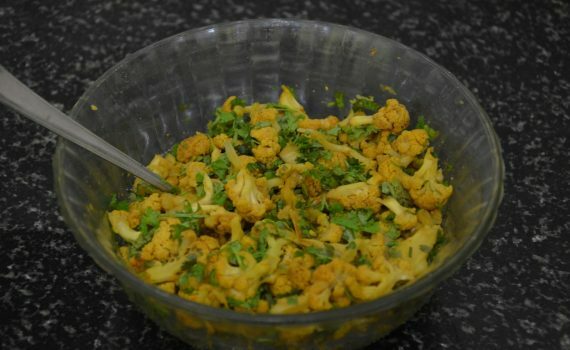 The resulting “No-oil, Microwave Gobi/Cauliflower ka sabzi” is not only easy to make but also turned out pretty good. You could even try the same recipe with broccoli(or any other vegetable) in lieu of the cauliflower. Put the cauliflower florets in a microwave-safe bowl and microwave for 5 mins. Then sprinkle some salt on it and mix-well. Microwave again for 2-3 mins. Mix well. Repeat this procedure every 2-3 mins, till the cauliflower is almost cooked.Test for salt(add more if needed). Sprinkle the red chilly powder, turmeric and the cumin powder and mix well. Microwave again (mixing every 2-3 minutes) till the cauliflower gets cooked. Add the lime juice and mix well. Garnish with the cilantro leaves. 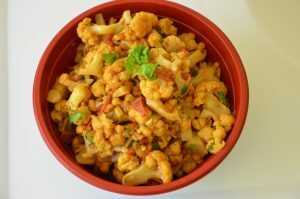 Serve the “No-oil, Microwave Gobi/Cauliflower ka sabzi” with phulkas or as a side with rice and dal.